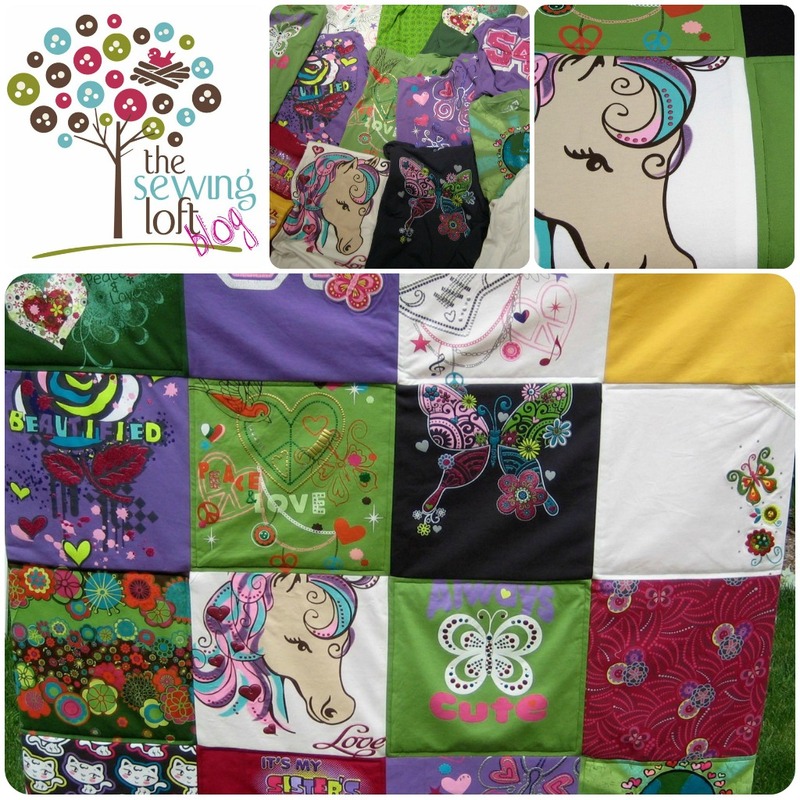 Over the years, I have made countless memory quilts for clients. The materials range from baby clothes, concert shirts to full blown 3 piece suits. This “How To” series will walk you through the basics of creating a tee-shirt quilt. Part 1 in the series is all about gathering your materials, determining your sizing and cutting. 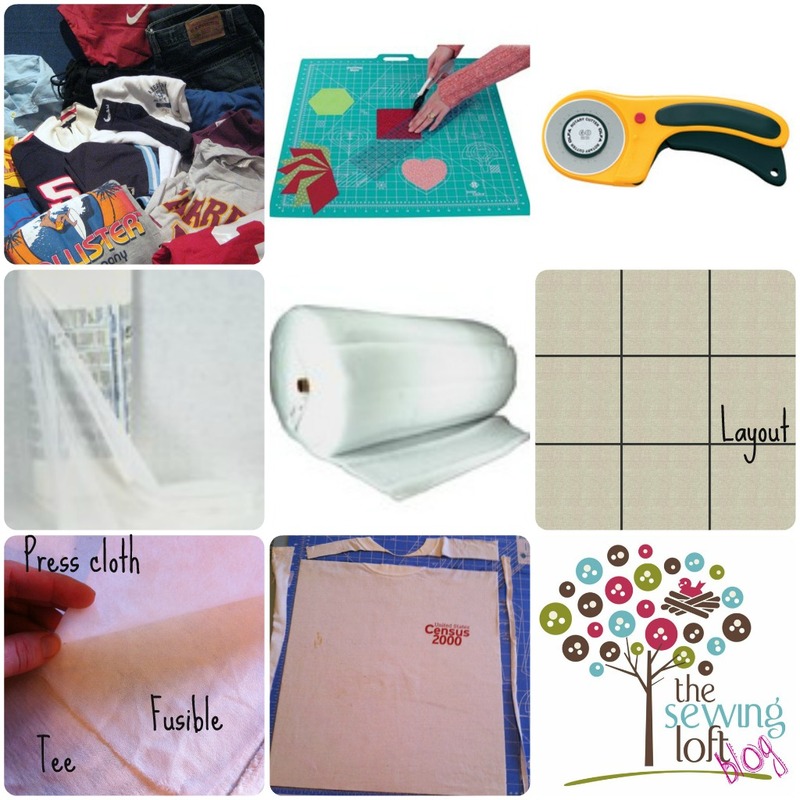 For today’s “how to” you will only need the tee shirts and tricot fusible. Gather all of your times you would like to include in your quilt. Be sure that they are clean and ready to use. You will need to find a flat surface to lay out your tee shirts for cutting. Sizing- Before you can start cutting each square, you need to determine the finished size of your quilt and number of squares you will be including. I will be creating a 25 square/pieced quilt that will finish as a full. (82″ wide x 87″ tall ish) I will create 5 rows of 5 blocks. Each block will finish 16 1/2″ wide x 17 1/2″ tall. But I need to add seam allowance. To make things easy, I am going to add 1/4″ seam allowance to each side. Each finished block will be 17″ wide x 18″ tall. To start my process, I like to cut fusible interlining larger than my finished block. (this will give me wiggle room later when cutting.) For speed, I suggest cutting them all at once. Cut 25. Cut off your necks and sides of tee shirts. You will be left with 2 large rectangles. After all pieces are fused, cut to size. A self-healing mat, roto cutter and quilters ruler will make quick work of this step but are not needed. Let’s get the prep work done and next week we will start stitching! This is a fabulous idea Heather!!!!!! You should see the bins of baby clothes I have… I just can’t part with them. This is a GREAT idea!!! You can visit me at http://www.theinklingsoflife.com if you’d like. Thanks so much for the visit! I love your idea on how to sort!! Thanks for sharing. Hello, I just found your blog through FB! I’m just getting back into sewing and have been searching for blogs to connect with. I hope you’ll visit my blog and become a follower. I’d also love for you to add this tutorial to my Frugal Treasures Tuesday party going on now. I’m looking forward to sharing projects and picking up tips to hone my sewing skills. It has been a while and I’m using a borrowed machine until I can buy a new one; probably not until fall. : ( But then I’ll be able to pick what I want. Any suggestions on type of machine? I’m a pretty good seamstress, used to make my own clothes. Now it will be mostly home decor and sewing for my granddaughters, two 4yr olds and a new one due in June. Sewing needles depends on what type of fabric you are stitching. Most needles are universal. I happen to own several Babylock machines so you are in luck. Check out Schemtz brand needles. They can be found at any sewing store and I believe that even WalMart carries them. Let me know how you make out! Another great tute – I’ve never made a quilt before but want to try this year! I shall be waiting eagerly for the next step! Memory quilts are really great ideas full of moments in our time. it will bring back memories every time one looked at it. Yours is a great way to recycle. Your tutorials are always so good. Love your idea of cutting all the interfacing at the same time. That would certainly speed up the cutting the t-shirts process. Visiting from The Porch Parade. Thank you so very much for sharing this at The DIY Dreamer… From Dream To Reality!! My grandmother made me a memory housecoat when I was a girl and I thought it was the coolest thing to see all the material from my clothes in it. I’m sure your memory quilts are received the same way, I did my housecoat. Nice work! Thanks for sharing at the Rock ‘N Share. where are the other parts….struggling to finish 1st tshirt quilt! Susan, I am sorry you are having trouble finding the mini series. Please feel free to use the search box when looking for any post. Here is part 2 https://thesewingloftblog.com/2012/03/21/how-to-memory-quilt-part-2-stitching/ and then the wrap up is here- https://thesewingloftblog.com/2012/04/04/how-to-memory-quilt-part-3-finishing/. This is fantastic! I’ve been thinking of making my kid a quilt for when she goes to University and this is just the tutorial I’ve been looking for! I had to ‘fess up to her what I was doing because she didn’t want to give up her favourite t-shirts for the project, but now she knows she’s really excited. Can’t wait to start this! Thanks so much. I’m glad you posted this. I’ve been setting aside my daughters favorite shirts as she’s outgrown them. We’ll turn them into a baby blanket for her baby…even though she’s only four now! I’m a newbie to sewing so your tutorial helps bunches! Bookmarking this. Thanks! I am so glad the how to is helpful. Memory quilts are some of the best ways to keep those memories front and center. And what a cherished piece for you to create and pass down to your one day grandchild. Way to think ahead! Thank you for the easy to follow instruction. You are so creative. ..what a blessing! So where is part two for this? I’ve been trying to find it and can’t.